While there’s no small part of this critic that wants to hang this band which calls itself The Misfits and dismiss them as heretics (I’ve done it continually for years), the truth is that I just can’t do it now. 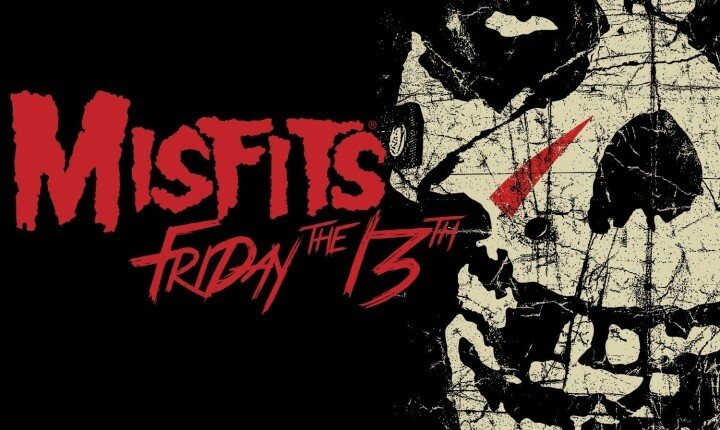 The truth is, the four songs which comprise the Friday the 13th EP are the best that the band has done in years; they’re dark but urgent and walk that ever-so-treacherous line between punk rock brilliance and cultural farce that the band used to take great, malicious joy in slam dancing upon, but tripped over (and never really recovered from) decades ago. Right off, that the band is sounding leaner and hungrier than they have in years is undeniable â€“ but the going only gets richer as one digs deeper, after that. The first time they throw this EP on, listeners who aren’t prepared for what’s coming, will physically recoil at the impact that â€œFriday the 13thâ€ exerts on their ears. Here, guitarist Jerry Other immediately begins stirring up a muddy, sludgy maelstrom while drummer Eric Arce initially pounds out a tribal rhythm â€“ but the whole thing sputters and then spontaneously re-aligns into a muscular punk melange which surges forward, streamlined with singer/bassist Jerry Only riding the crest of Arce and Other’s wave in a voice which could best be characterized as â€œpower lounge.â€ Only’s vocal doesn’t really reach, stretch or give listeners the impression that his performance requires a lot of effort, but that ease is also attractive; Only’s not rushing toward listeners earnestly, he’s making them come to him â€“ and they will. The exact same formula employed for â€œFriday the 13thâ€ works in â€œNightmare On Elm St.â€ There, Jerry Other shifts gears into a more stock, â€œall on the down-strokeâ€ and Ramones-esque progression which does not pause or relent once in the song’s 2:45-running, and then it just blinks out of existence leaving listeners to clean themselves up; it’s just quick, easy and almost impersonal, and a really good foil for â€œFriday the 13th.â€ Like the movies for which the songs are named, they’re cut from the same fabric but are completely different experiences. As the EP continues, â€œLaser Eyeâ€ keeps the trend set by â€œFriday the 13thâ€ and â€œNightmare On Elm St.â€ in play as it sort of intermingles images of Evil Ernie, Evil Dead and X Factor-era Iron Maiden into a fine (and fast), punky pastiche before crossing vintage Misfits histrionics with a Meatloaf vocal grunt to close out the proceedings. Now, some longtime Misfits fans may balk at the final, kind of fluffy, turn that â€œMad Monster Partyâ€ represents as really mawkish (come on â€“ if you can’t imagine Jerry Only throwing lyrics like, â€œCause we were barely seventeen and we were barely dressedâ€ into this song somewhere for kicks on a live stage, you’re just not trying), but the truth is that it’s also easy enough to look at that last song as malicious fun â€“ like painting a hearse blaze orange with a green racing stripe. It’s great â€“ in its own way, on the right day. Being â€œgreat in its own way, on the right dayâ€ is a good way of viewing the Friday the 13th EP in general, to be honest. After so many years of just limping along or treading water on their best days, the sort of fun, gallows humor splattered all over this EP plays like a breath of fresh air and is capable of really renewing hope for the band’s future.